Dylan Roberts is the city’s Chief Information Officer, in which role he is accountable for delivery of place-based outcomes for and across multiple organisations including seven health and care organisations, Leeds City Council, Leeds schools, and three NHS CCGs. In our first podcast in this series, Dylan described the benefits of a city having an approach to ‘smart’ that is genuinely shared between the council and other public services, particularly health. In this and each of five following podcasts we will discuss one of six aspects the city has identified as being key to building a smarter Leeds, which you can read more about on Data Mill North's Smart Leeds page. Three of these aspects, connectivity, digital skills and data, are cross cutting. Three others focus on vital areas of public service delivery: health & wellbeing, housing and travel & transport. In this podcast, we focus on connectivity. Re-thinking life-styles and life-choices, planning work-life balance in This Smart Life. Recruiting for this smart life. Retaining employees. Managing the remote workforce. Work as state of mind not as a place of labour. An end to commuting, to traffic congestion, to particulate pollution. Hard tech servants, soft tech services. Voice bidable things and the Towers of Babel. Chair/host TBC. Five guests and our host debate This Smart Life - "too damned smart or not smart enough". Guests include Darren Capes Intelligent Transport Systems Policy Lead at Department for Transport; Linda Chandler Founder Hyperlocal Cities formerly Microsoft Smart Cities Lead based in Singapore and for eight years the Microsoft Architect for Smart Cities initiative and Dr David Greenfield, founder of SOENECS, Chartered Waste Manager, Fellow of the CIWM, Fellow of the RSA, Associate Member of the ICE and Chartered Environmentalist. All this takes place at 58 Victoria Embankment (the NESTA building) two minutes walk from London Blackfriars Station. Cameras are rolling by 11:00am and it's all over bar the handshakes by 3:40pm. Lunch and refreshments? Of course. But let’s be frank, it’s the quality of the brain food not the sandwiches that make this the single most useful ticket for those shaping the future of UK local public services. An Audience with CLGdotTV is now running eight times a year. 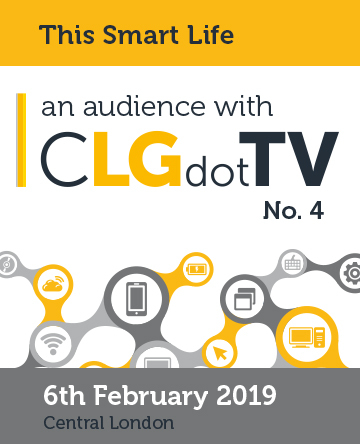 We invite a studio audience of around 50 to join us to make five CLGdotTV programmes. There are no power-points and the questions and interventions from the floor are valued as much as much as the panellists' contributions.